Oh Animorphs... Hardest I've laughed at an xkcd in a while. If I were in the area, I'd totally try to get myself on one of these flights. Not entirely sure what I'd do, but if nothing else it'd be a cool experience! Ghost mushrooms? First thing I thought of was Cave Story. This felt like one that's gone through the simplewriter. Unfortunately it doesn't quite fit, but it sure feels like it does. Title: If you're not completely satisfied with the phone after 30 days, we will return you to your home at no cost. 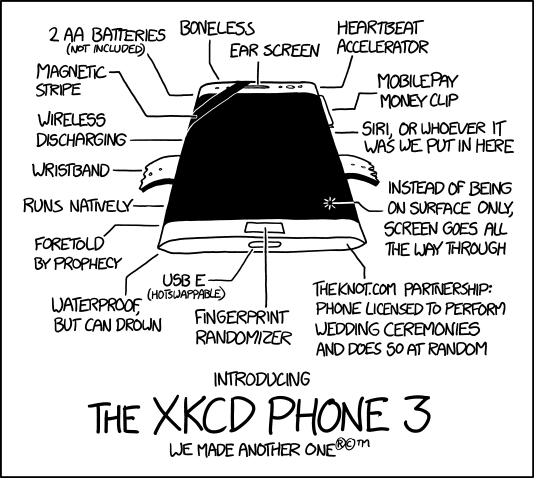 How long until the pile of useless features reaches critical mass and becomes a phone singularity? Seemed more like a reference to these two What-Ifs to me. The comet looks like some kind of heart in that image. The livestream just stated that the harpoons never actually fired. Oops. The turn signals. Thank god I'm not the only one who gets eternally frustrated by that. Why can't they ever be in sync?